Welcome to The Retreat at Waterwood! Book your stay in our recently remodeled 4 bedroom, 4 bathroom townhome located near a lovely pond with fountain. 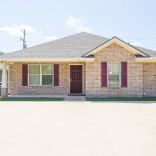 Our fabulous townhome resides in a gated community with a basketball court, pool and hot tub privileges, located just a few miles away from the Texas A&M campus. 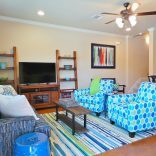 Bright, open and spacious, the downstairs common area is perfect for family gatherings, football weekends, and Aggie events. Multiple seating areas throughout accommodate a house full of people to lounge, relax and catch the game on the 55” TV in the living area. The kitchen features granite countertops and is equipped with all the appliances you might need for preparing a home-cooked meal for your Aggie when visiting. Everybody gets a room, so bring the entire family! Delightful décor will excite your senses and the new linens surround you in softness. There is one bedroom downstairs with a queen bed. There are three bedrooms upstairs, one with a queen bed and the other two both have two twin beds. Each bedroom has its own bathroom, guaranteeing privacy and space for each of your guests to get ready. With a small furnished patio, enjoying a cup of coffee in the morning, or grilling and entertaining is a breeze. Your rental includes 4 covered assigned parking spaces behind the townhouse with additional visitor parking spots available if needed. Enrich your family gatherings with promising memories by booking with us annually for family events, football game weekends, or any holiday in Aggieland! 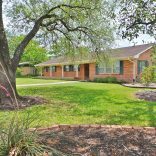 Choose The Retreat at Waterwoood for your next trip to Aggieland.